Skin contact with chemotherapy drugs can pose a significant health risk to medical professionals, so they wear examination gloves as a protection. In order for them to be considered fit for purpose, it is important they are tested for suitability. SATRA has invested in a new, purpose-built laboratory to evaluate the resistance of medical gloves to permeation by chemotherapy drugs. Permeation is the process by which a chemical passes through a barrier – in this case, the glove material. This occurs at a molecular level (in a process similar to osmosis) and in many instances, the process of permeation does not cause any physical change to the glove. 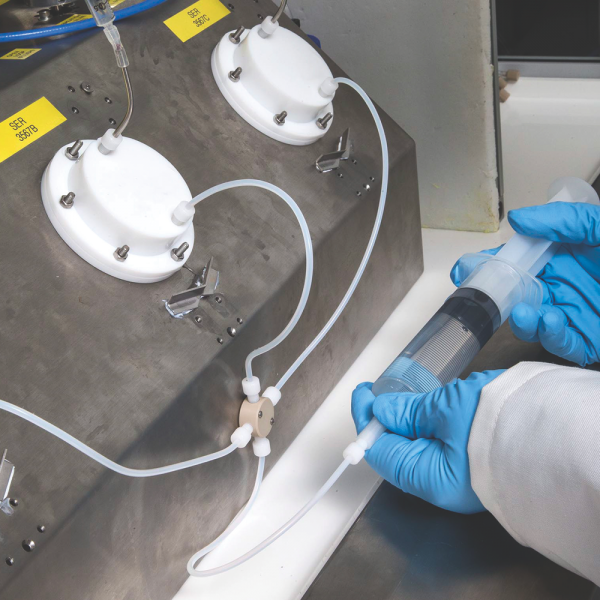 To test the permeation resistance, a representative specimen of the glove is clamped between two halves of a permeation cell, with the drug on one side and the collection solution on the other. 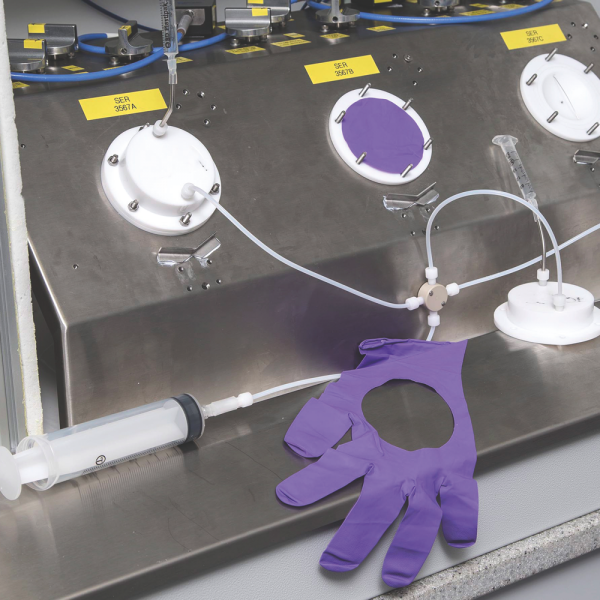 The resistance of gloves to permeation by chemotherapy drugs is determined by measuring the time taken for the maximum permitted permeation rate to be achieved – also called the ‘breakthrough time’. This breakthrough time is expressed as the amount (in µg) of challenge chemical per surface area (in cm2) of the test specimen per minute. One of the most called for testing standards is ASTM D6978-05. 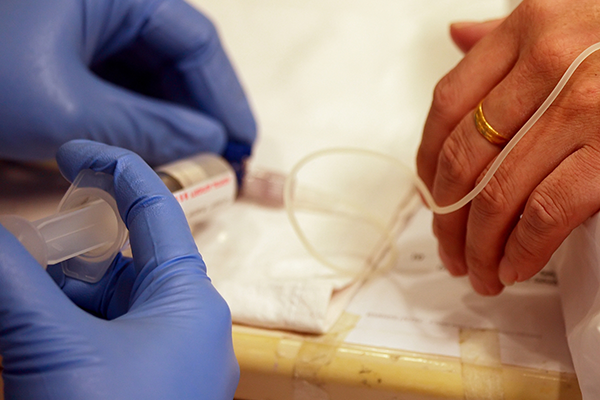 Testing in accordance with this standard requires the use of at least nine chemotherapy drugs. This includes seven compulsory drugs and a minimum of two additional drugs from the list of additional chemotherapy drugs (see tables 1 and 2). The full list of 24 drugs includes the four common methods in which chemotherapy drugs affect cancer cells. These are by i) damaging the DNA of the cancer cells, ii) by replacing some sections of the cancer cell DNA, iii) by damaging the enzymes within the cancer cells and iv) by preventing the cancer cells from duplicating. There are a number of methods for measuring the resistance to permeation by chemicals. To assess suitability for working with chemotherapy drugs, the most commonly used method for the determination of breakthrough time is ASTM D6978-05. When analysing in accordance with this standard, the test is performed at 35 ± 2ºC over a four-hour time period, with the permeation rate that is defined as a breakthrough being 0.01µg of the specific drug, per cm2 of glove surface area per minute of the test (0.01µg/cm2/minute). It is possible to use alternative test methods for this analysis, such as EN 16523-1:2015 + A1:2018, where the test is performed at 23 ±1ºC over an eight-hour time period, which has superseded EN 374-3:2003. Here, the maximum permitted change in concentration for a breakthrough being 1µg/cm2/minute. These differences mean that it is not possible to directly compare performance between the two methods. SATRA uses an in-line flow cell with ultraviolet spectroscopy as a detection technique for chemotherapy drugs. This makes it possible to continuously monitor the concentration of the chemotherapy drug in the collection media, rather than measuring at discrete time intervals. The result is that more data is obtained, which therefore enables a much more accurate determination of the breakthrough time. In addition, SATRA can also perform testing in accordance with EN 16523-1 for a wide variety of chemicals, including acids, alkalis, organic solvents, disinfectants or cleaning solutions. Our range of detection techniques include conductivity, gas chromatography (GC) with either flame ionisation (FID) or photo ionisation (PID) detectors, ultraviolet/visible (UV/Vis) spectrophotometry ion chromatography and high performance liquid chromatography (HPLC). Please contact chemistry@satra.com for further information on testing resistance to permeation by chemotherapy drugs or other chemicals.